By hungry runner on February 20th, 2012 . Filed under: Crafts . 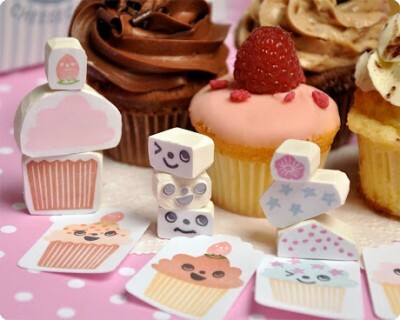 I love this changing face cupcake stamp set from Memi The Rainbow. The Parisian Etsy shop offers the set of 9 stamps for $35.00 that form different faced cupcakes. You can make your cupcake laugh, smile, wink or sleep then add star or circle sprinkles to make a unique cupcake.